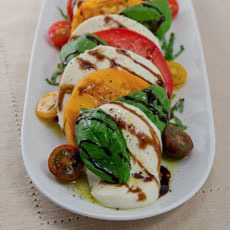 One of a foodie’s favorite salads is the Caprese, a delicious combination of tomato, basil and mozzarella that was “discovered” in Italy in the 1950s (the history of Caprese salad). Tasty basil and mozzarella are available year-round, but luscious summer tomatoes are required to make this simple combination soar. Until the crop comes in, look at alternatives—including cherry and grape tomatoes. The gifted chef Linda Anctil of PlayingWithFireAndWater.com offers a new way to look at Caprese salad. She balances different sizes of mozzarella balls and tomatoes to a lovely effect. 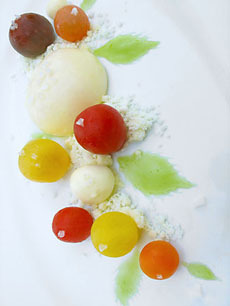 Caprese salad on an artistic canvas. Photo courtesy Linda Anctil | PlayingWithFire.com. Linda actually injected the peeled heirloom tomatoes with basil oil and made mozzarella “balloons” filled with tomato water foam. She painted the “basil leaves” onto the plate with basil gel, and garnished the dish with olive oil powder and Balinese sea salt. This takes lots of skill! of tomatoes. Photo courtesy Balducci’s. We adapted her concept with conventional Caprese ingredients, including fresh basil leaves and droplets of fine olive oil, basil oil and balsamic vinegar. All are delicious food fun!